Our goal is to connect people with the best local experts. We scored tree service professionals on more than 25 variables across five categories, and analysed the results to give you a hand-picked list of the best tree service professionals in Las Vegas, NV. 3 Brothers Tree Service has been exceeding customer expectations with top-notch tree care for more than 20 years. Henderson-area property owners with the most exacting standards trust the experts to enhance the appearance of trees and avoiding costly damage with removal services. The locally-owned business helps ensure client properties look their best with tree removal, stump grinding, lot clearing, and storm damage cleanup services. 3 Brothers Tree Service makes safety a top priority by maintaining the proper insurance and bonding for protection and peace of mind. The full-service tree care and maintenance providers have an outstanding reputation for boosting client property value and curb appeal with comprehensive trimming and landscaping services. Residential and commercial customers can depend on the expertise of 3 Brothers Tree Service to avoid costly property damage with tree shaping and damaged limb removal. AAA Professional Tree Service has been providing property owners in the Las Vegas area with high-quality services that ensure the health and beauty of trees for more than 25 years. The fully licensed and insured business specializes top-notch tree care that significantly enhances the curb appeal and value of any home or business. AAA Professional Tree Service features a team of highly skilled professionals with the highest degree of expertise in all aspects of trimming, pruning, removal, stump grinding, and tree maintenance. Discerning customers with the most exacting standards trust the experts at AAA Professional Tree Service to deliver prompt, courteous service without ever compromising safety or cutting corners. The family owned and operated Davila Tree Service had been serving Las Vegas and surrounding areas such as Blue Diamond and Henderson with residential and commercial tree services for more than ten years. Specializations include but are not limited to tree removal, trimming, pruning, spraying, planting, stump grinding, shrub removal, landscaping, and land clearing. Its team of arborists can also cut palm trees by removing dead branches. A 24-hour emergency service is available. Its website features a photo gallery with past tree care projects to help customers gauge the quality of work. Customers can also call to have a free estimate done for home or business projects. Henrie Tree Service is a company that operates in the Las Vegas, NV area and provides exceptional tree and vegetation maintenance for their customers. Their top priority is customer satisfaction, their team is highly qualified, and they use the best equipment in the industry to make sure their customers are getting the best tree solutions in the market. They offer tree removal, tree trimming, stump removal, pruning, and thinning. For emergencies, Henrie Tree Service is available every hour of every day. Their clients describe them as affordable and trustworthy, and they state that the services the company provides are excellent. Las Vegas Tree Service is a tree service company located in Las Vegas, NV. The company employs tree experts who offer harmless tree assessments. Their employees are licensed and insured tree professionals who are also certified and quality control experts. The service provider uses specialized equipment to perform a variety of tree services, including tree surgery and treatment, debris removal and haul-away, tree removal, tree remains grinding and eradication, tree trimming, and tree shaping. Afforestation and deforestation services are also available. The company services cities in or around the Las Vegas metro areas, including Hoover City, Bonanza Village, North Las Vegas, Vegas Heights, Eastland Heights, Winchester, Wann, Sunrise Manor, Winterwood, Paradise, Bracken, Hillegas, Boulder Junction, Spring Valley, East Las Vegas, and Whitney. Limb It Less Tree Service has been serving the residential and commercial tree care needs of Greater Las Vegas, NV since 2000. This contractor is known for its expertise in hot-weather tree, shrub, bush, and lawn care. Limb It Less Tree Service specializes in Palm tree trimming and shaving, stump grinding, yard and lot clearing, staking, cabling, and standard tree removal services. As a full-service tree and lawn care provider in this region where temperatures commonly top 110° Fahrenheit, families and businesses around Las Vegas depend on Limb It Less Tree Service for expert water sprinkler system installation and professional fertilizer programs. The company also has a timely 24/7 emergency service. Mr. Tree is a tree removal and tree clean-up service located in Nevada. The business provides service to the Las Vegas and Henderson cities and areas. They are also able to provide free quotes and estimates to prospective clients. MR. Tree is a certified arborist business, and they strive to provide efficient and fast tree services. Some of their many services include tree removal, tree trimming, palm tree trimming, emergency removal services, complete clean-up after a job is over, and more. They can also provide preventive services such as tree injections and more. Mr. Tree provides free consultations with their certified arborist. Nevada Tree Service in Las Vegas, NV provides a wide array of tree services in the greater Las Vegas valley and surrounding area. In business since 1962, the locally-owned company is insured and licensed to operate. Workers can transplant, remove, or trim existing trees, including palm trees. They can also put together a maintenance plan to keep trees healthy and green, install cabling and bracing, or fertilize trees. Managing tree roots, chipping and removing brush, and working to prevent tree diseases are also jobs Nevada Tree Service can handle. Emergency tree removal service is available, before or after a storm. The company provides free estimates. Clients praise the company for its speed and work quality. Rocky's Tree Service offers professional tree services to commercial and residential customers in Las Vegas, NV, and surrounding areas. The company is locally owned and operated and a Certified Arborist. Services from Rocky's Tree Service include but are not limited to commercial landscaping, tree spraying, tree pruning, tree planting, tree removal, tree stump grinding, stump removal, lawn maintenance, and general tree services. Technicians with the company offer trimming services that ensure the safety, health, and beauty of trees and shrubs. The business also provides 10% off any service for new customers. The company cites prompt service and high-quality service as its strengths. Ryan’s Tree Care is a full-service tree service company that has served customers in the Las Vegas area since 2001. The company provides a range of tree care services, including tree trimming, pruning, and removal; stump grinding; tree staking and cabling; and storm damage removal. Ryan’s Tree Care also provides 24/7 emergency tree service. The company prides itself on its safety record, not having filed a liability insurance or workman’s compensation claim in over a decade. 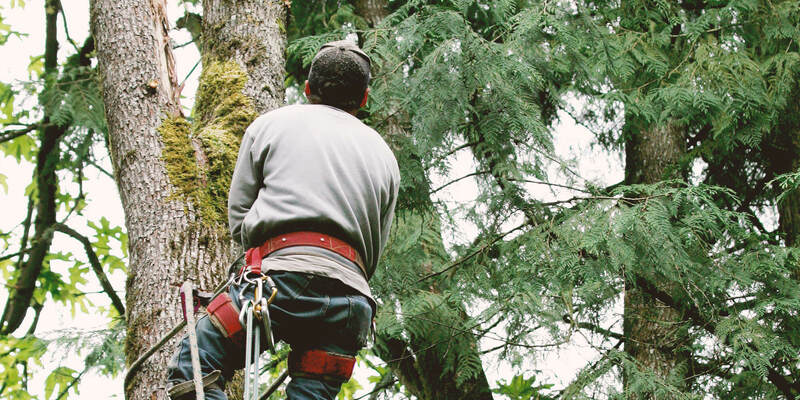 Ryan’s Tree Care uses a certified arborist on many jobs and utilizes different sizes of cranes to remove trees from hard-to-reach areas, as well as a variety of rigging devices. Vegas Best Tree Service is a premier tree service company offering superior service to residential and commercial properties in Las Vegas, Nevada. Their expert team of arborists takes pride in their unparalleled work ethic and exceptional service given to each project they complete. They are knowledgeable, committed, and fully equipped to tackle any job, small or large. Las Vegas Best Tree Service is known for their “5 Day Brand Promise” which guarantees they will service each customer's tree care needs within five days of calling. Clients may rely on Vegas Best arborist for tree trimming and pruning, tree removal, stump grinding and removal, emergency services, tree transplanting, and palm tree care. For customer testimonials, clients may visit the website. Walt’s Tree Service is a family-owned and -operated, fully licensed and insured tree service located in North Las Vegas, Nevada. For over 60 years, since 1951, Walt’s Tree Service has been serving residential and commercial clients in Las Vegas and the surrounding areas, including Henderson and Summerlin. Walt’s Tree Service is fully equipped to handle all service needs, including but not limited to tree trimming and removal, stump grinding, emergency services and storm damage, microinjection tree care, general yard cleanup, and debris removal. Walt’s Tree Service offers low prices, flexibility and professionalism for each job, with no hidden surcharges. Woody’s Tree Service has been providing Las Vegas-area property owners with top-notch services that meet a range of individual needs for more than 15 years. The full-service tree care specialists maintain the highest degree of expertise in all areas of tree trimming, removals, stump grinding, yard cleanup, and more. The trusted business strives to deliver cutting-edge services that add beauty and value to client properties while ensuring the health, safety, and structure of trees. Woody’s Tree Service also provides palm tree trimming services that boost curb appeal and remove potential hazards. Discerning property owners with the most exacting standards depend on the expertise of the company to deliver professional quality tree care without ever sacrificing safety or cutting corners.